Our next Power Read begins January 16th. Join us! So, you’re interested in reading the Bible? Wonderful! And guess what? You can read it in 60 days. Seriously. Over the past several years, I’ve been helping people all over the world “Power Read the Bible” in just two months. People really do want to read the Bible. And most importantly, they want to understand it. Does the Bible seem like a confusing collection of random stories and sermons? 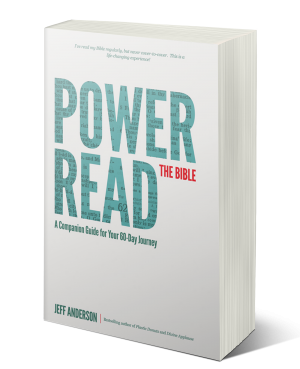 The Power Read the Bible journey will help you see that the Bible is readable and understandable, especially when read quickly. There’s something else that helps people achieve their Bible reading goals – encouragement. For 60 days, I’ll help you keep the Bible’s big picture in view, along with special insights and encouragement to help you stay on track. And it’s completely free. Is a 60-day read really possible? Daily reading time varies from person to person, but you can expect to invest approximately one hour a day. The Power Read is a “hurry-up” read experience. The goal isn’t to understand every detail. The benefits are different. Familiarity. Big picture. Making the Bible smaller and less intimidating. Read the Bible in 60 days – with refreshingly simple daily encouragement! The Power Read challenge begins in mid-January (after we’ve had a chance to break all those pesky resolutions). The 60-day reading plan – free! Our next Challenge starts in January! If you’d like to begin sooner, or have a printed guide, click here to purchase the Power Read book!